This is the old Island Airport terminal. It's sitting out there at Hanlan's Point, all by itself, as Porter planes take off in the background. It was built by in the 1930s — by the federal government as part of a Trans-Canada airway — back when passenger planes were still something of a novelty. 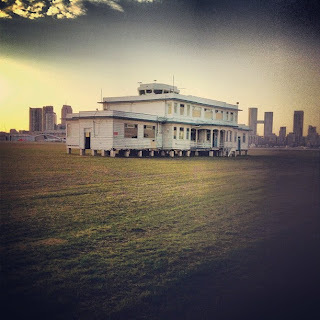 And that's one of the reasons the building has been officially recognized as a National Historic Site: it's one of the few terminals to have survived from those early days of air travel. It used to be right in the thick of things, but last year it got in the way of the construction of the new tunnel to the mainland they're building so that Porter customers don't have to take the ferry. The building was uprooted and moved out here (despite, it seems, the historical designation — which specifically includes "the building on its footprint"), where it waits on blocks for someone to decide what to do with it. At the time of the move, a spokesperson from the Toronto Port Authority told the Star, "We are looking to make sure it's properly used as a heritage building, whether it's to move it or keep it on site and make it accessible long term... We haven’t had a final firm offer but we're confident that there will be interest." A year later, as Porter looks to expand the airport even further, it seems that the fate of the old terminal is still up in the air. Shawn Micallef recently wrote about some of his ideas for the building — and his memories of it — in his column for the Star. You can check that out here. And the website for Canada's Historic Places has more detail on the building's history and architectural significance here. Photo by Adam Bunch on Instagram: @TODreamsProject.